In Materials Science, investigations aiming to prepare new types of molecular sieves (porous materials) have opened a productive field of research inspired by the crystal structures of minerals. These new molecular sieves are distinct from zeolites in that they have different kinds of polyhedra that build up their structures. Of particular interest are the new molecular sieves characterized by a mixed "octahedral"-tetrahedral framework (heteropolyhedral frameworks), instead of a purely tetrahedral framework as in zeolites. Heteropolyhedral compounds have been extensively studied since the early 1990's, with particular attention having been focused on titanosilicates, such as ETS-4 (synthetic analog of the mineral zorite) and ETS-10. However, titanosilicates are not the only representatives of novel microporous mineral phases. The search for "octahedral"-tetrahedral silicates was extended to metals other than titanium, for instance, the zirconosilicates with the preparation of synthetic counterparts of the minerals gaidonnayite, petarasite and umbite. Many microporous heteropolyhedral compounds containing metals such as Nb, V, Sn, Ca and lanthanides, have been reported and a wide number of distinct structural types (e.g., rhodesite-delhayelite and tobermorite) have been synthesized and structurally characterized. Moreover, the potential applications of these novel materials have been evaluated, particularly in the areas of catalysis, separation of molecular species, ion exchange and optical and magnetic properties. Whereas rarely the crystalline synthetic products are suitable for single-crystal structural investigations, the natural counterparts are often well crystallized. Crystallization in nature occurs from chemical systems characterized by a wide compositional range, thus producing compounds with a very rich and variable crystal chemistry, which may provide precious information, suggesting possible substituting elements and addressing the synthetic work in a very productive way. The present volume follows a meeting on "Micro- and mesoporous mineral phases" (Rome, December 6-7, 2004) that was jointly organized by the Accademia Nazionale dei Lincei (ANL) and the International Union of Crystallography (IUCr) via its Commission on Inorganic and Mineral Structures (CIMS). The meeting was convened by Fausto Calderazzo, Giovanni Ferraris, Stefano Merlino and Annibale Mottana and financially supported by several other organizations representing both Mineralogy (e.g., the International Mineralogical Association and the European Mineralogical Union) and Crystallography (e.g., the European Crystallographic Association and the Italian Association of Crystallography). To participants, ANL staff, organizations, and, in general, all involved persons, our sincere acknowledgments; in particular, we are grateful to Annibale Mottana who was able to convince the ANL Academicians to schedule and support the meeting. This volume of the RiMG series highlights the present knowledge on micro- and mesoporous mineral phases, with focus on their crystal-chemical aspects, occurrence and porous activity in nature and experiments. As zeolites are the matter of numerous ad hoc meetings and books - including two volumes in this series - they do not specifically appear in the present volume. The phases of the sodalite and cancrinite-davyne groups, which mineralogists consider distinct from zeolites, are instead considered (in the order, chapter 7 by W. Depmeier and part of chapter 8 by E. Bonaccorsi and S. Merlino, respectively). The first two chapters of the volume cover general aspects of porous materials. This includes the application of the IUPAC nomenclature developed for ordered porous materials to non-zeolite mineral phases (L.B. McCusker, chapter 1) and the extension to heteropolyhedral structures of a topological description by using nodes representing the coordination polyhedra (S.V. Krivovichev, chapter 2). Chapters from 3 to 7 are dedicated to various groups of heteropolyhedral porous structures for which the authors emphasize some of the more general aspects according to their research specialization. 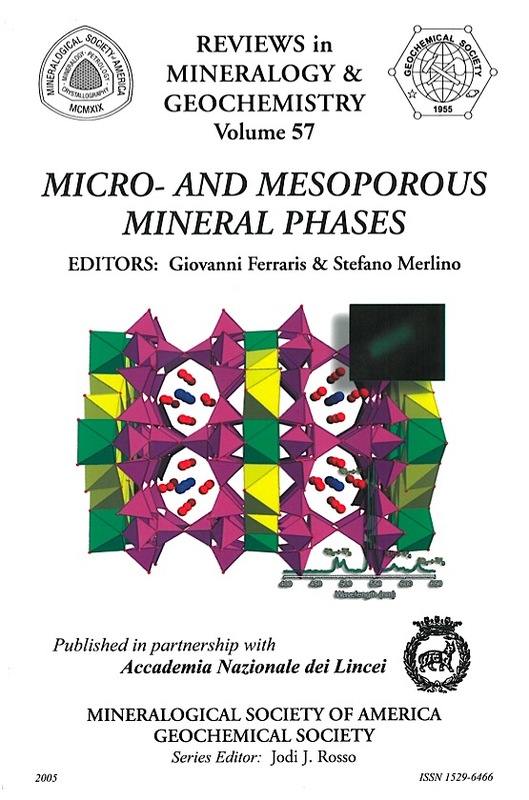 G. Ferraris and A. Gula (chapter 3) put the emphasis on the modular aspects of well-known porous phases (such as sepiolite, palygorskite and rhodesite-related structures) as well as on heterophyllosilicates that may be not strictly porous phases (according to the definition given in chapter 1) but could be the starting basis for pillared materials. The porous mineral phases typical of hyperalkaline rocks (such as eudialytes and labuntsovites) are discussed by N.V. Chukanov and I.V. Pekov under their crystal-chemical (chapter 4) and minerogenetic (chapter 5) aspects showing the role of ion exchange during the geological evolution from primary to later phases, with experimental cation exchange data also being reported. J. Rocha and Z. Lin (chapter 6) emphasize how research on the synthesis of octahedral-pentahedral-tetrahedral framework silicates has been inspired and motivated by the many examples of such materials provided by nature; synthesis, structure and possible technological applications of a wide number of these materials are also described. Following chapters 7 and 8 - which besides the cancrinite-davyne group, presents the crystallographic features of the minerals in the tobermorite and gyrolite groups - M. Pasero (chapter 9) illustrates the topological and polysomatic aspects of the "tunnel oxides," a historical name applied to porous oxides related to MnO2, and reviews their main technological applications. 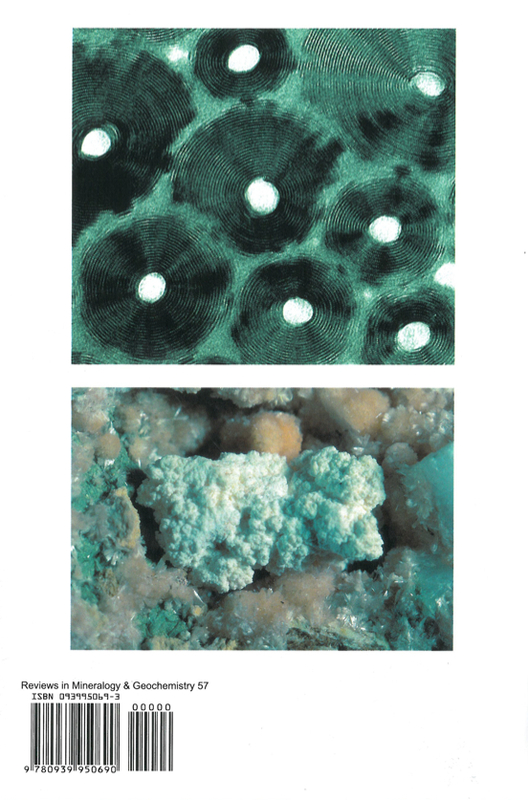 The next two chapters (10 and 11) draw attention to "unexpected" porous materials like apatite and sulfides. T.J. White and his team (chapter 10) convincingly show that the apatite structure type displays porous properties, some of which are already exploited. Chapter 10 also contains two appendices that report crystal and synthesis data for hundreds of synthetic apatites, a number that demonstrates how wide the interest is for this class of compounds. E. Makovicky (chapter 11) analyzes the structures of natural and synthetic sulfides and selenides showing that, even if experimental work proving porous activity is practically still missing, several structure types display promising channels. Chapter 12, by M. Mellini, is the only one dedicated to mesoporous mineral phases - which are crystalline compounds with pores wider than 2 nm. Examples discussed are carbon nanotubes, fullerenes - which occur also in nature - chrysotile, opal and, moving from channels to cages, clathrates.